Who is the lamer/better villain: Carver or Bloody Mary? 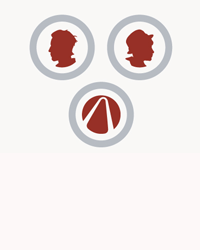 William Carver of TWDG and the Fable who came to be known as Bloody Mary from TWAU are both notable antagonists from Telltale Games circa 2014. 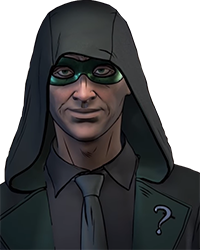 With a penchant towards soft speech, terror, torture, harassment, and especially psychopathy, both villains received a considerable amount of hype coming from their involvement in their respective Telltale game. Both are also borderline Generic Doomsday Villains who both exist for little reason than to have an intimidating and/or "cool" ultimate villain for the protagonists to contend with. The question here is which one is the more notable within a character and/or narrative context? Which one is the better antagonist, who is more effective, interesting, and memorable; which is the lamer villain, who is more impotent, dull, and cliche? I think Bloody Mary is a better antagonist,i always thought her "final stand" against Bigby in EP5 was..kinda anti-climatic,but i never really had a problem with her,she's great. Carver..Well i still think he's awesome but i feel like they could've done more things with him,i remember that scene in EP2 about Alvin killing George,and nothing really came out of that,then in episode 3 he kinda went off the rails.. So yeah,Bloody Mary for me is better. Eh, I guess it's true that Bloody Mary technically wasn't meant to be super important in the story and didn't have much in the way of expectations set. But she really wasn't much of anything to me anyway. I think Bloody Mary is a better antagonist,i always thought her "final stand" against Bigby in EP5 was..kinda anti-climatic,but i … morenever really had a problem with her,she's great. Carver..Well i still think he's awesome but i feel like they could've done more things with him,i remember that scene in EP2 about Alvin killing George,and nothing really came out of that,then in episode 3 he kinda went off the rails.. So yeah,Bloody Mary for me is better. Carver is better because he has motives for what he does and actually kills characters. I don't remember Mary killing anyone during the game, plus, she was a bodyguard. Carver is a leader. Mary is a follower. Mary has a memorablr boss battle. Plus, she was not really propped up as being that important or deep by the writing itself. 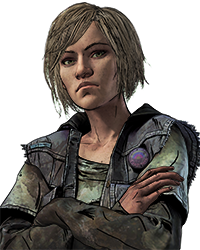 Bloody Mary was great, but she had very little screentime or actually involvement with the story until later on in the game. She could have been a great longterm villain had they made her more of a central part of the story building to the end. How do you think they could've done that? Could've introduced her separate from the Crooked man with her own motives that tied into the murders with her and Bigby having an initial confrontation between one another in EP1 that spanned through the entire season culminating into the final showdown between the two at the end of EP5. They could've had mini bosses throughout the episodes of fighting bloody marry's clones or having to counter her ability to transport and manipulate mirrors which she uses to her advantage. They could've even had a version where Bloody Marry corrupts the magic mirror utilizing it to gain the upper hand against Bigby unknowing to Bigby or Snow White of the mirror's corruption. I know one thing I liked about the Tweedles was that outside of their relevant orders, they were clearly detectives in their own right and there's implications that they take small time jobs from both humans and maybe fables alike. Could've introduced her separate from the Crooked man with her own motives that tied into the murders with her and Bigby having an… more initial confrontation between one another in EP1 that spanned through the entire season culminating into the final showdown between the two at the end of EP5. They could've had mini bosses throughout the episodes of fighting bloody marry's clones or having to counter her ability to transport and manipulate mirrors which she uses to her advantage. They could've even had a version where Bloody Marry corrupts the magic mirror utilizing it to gain the upper hand against Bigby unknowing to Bigby or Snow White of the mirror's corruption. Carver definitely. I was surprised what villain he is, left me really memorable of him. I always thought no matter what i do i cant win against him, he always finds a counter attack.